On October 30, 1996, it was discovered that Slash was officially no longer a part of the band, as lead singer Axl Rose sent a fax to MTV stating he and his former guitarist had experienced several disagreements regarding the band's musical direction, and ultimately parted ways. 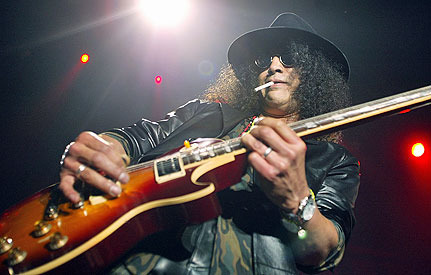 A crucial moment leading up to Slash's decision to quit the band occurred when Rose removed a section of Slash's guitar track on the cover of Rolling Stones' "Sympathy for the Devil" present in "The Spaghetti Incident?". Without his consent, Rose replaced Slash's guitar overdub with the work of Paul Tobias, a friend of Rose whom Slash and the rest of the band vocally disapproved of for years. Additionally, as revealed on a VH1 special, Slash stated that he never truly forgave Axl for his spiteful rant regarding some of his fellow band-mates during a 1989 concert.